I made an appearance on a local Detroit news program to discuss a negligent shooting that happened at a gun range. 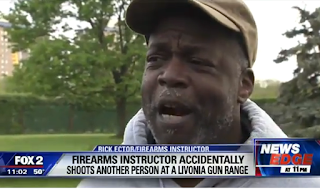 I personally knew the Firearm Instructor who had the negligent discharge. However, knowing and liking someone has nothing to do with safety. I hated that he negligently shot someone. I hate that he injured someone. Liking someone is a separate issue than liking him. This incident was preventable. There should not have been any loaded firearms in the classroom. You should always assume that a firearm is loaded. Everytime that you pick up a firearm, you should immediately point it in a safe direction and check to see if it is loaded. I hated that he had a negligent discharge. Firearm safety is important. Safe gun handling should happen every time that you handle a gun. No excuses. Just do it.